Combining the sweet-spicy flavors of a classic sriracha with the fermented complexity of gochujang chili paste, this fermented hot sauce will make you weak in the knees. It boasts just the right balance of sweet and heat, so it’s not too overpowering—and it makes a perfect complement to any Asian dish. We especially love it on rice or in a hot bowl of pho. Made by hand in Brooklyn, Weak Knees makes a perfect gift for that certain someone who thinks they’ve tried every hot sauce under the sun. I have gone through 3 bottles of this item in the last 2 months. I use it on breakfast sandwiches, add it to any kind of bowl I'm making with veggies and grains, use it to dip chicken into for an extra spice, marinate pork tenderloin before cooking, and in all soups and stews for a deep chili flavor. Gouchujang, Korean style fermented chili paste, is what gives this hot sauce its special flavor which is savory, sweet, umami, and completely addictive! 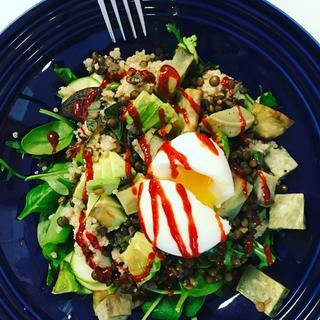 Lentils, avocado, sweet potato, arugula, and a soft boiled egg all drenched in Weak Knees Sriracha! Favorite Sriracha sauce! Been looking all over for it and finally found at Sur La Table! Have heard about Gochujang a lot, just wanted to try it. is the sauce in a glass or plastic bottle? BEST ANSWER: It’s in a plastic bottle.